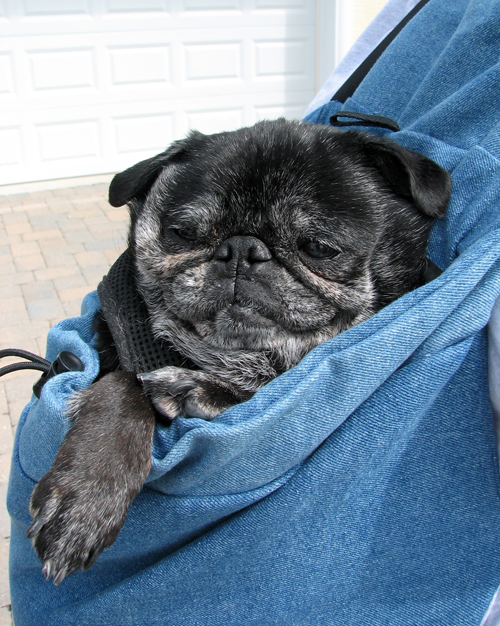 We try very hard to make sure the pugs get in one very good walk per day. They are always out and about during the day, walking to the mailbox or just taking a quick trip to the corner and back, but in the evenings we like to take them on a nice, long walk that is about a mile or longer. When we first got Sol I wasn’t sure how well she would do with our walking schedule. Don’t get me wrong, she loves to get out for a walk, but she by no means has the endurance of Benjamin, Henry & Luna. We didn’t want to start a routine where we walked her separately. She wasn’t too fond of being left at home while the three fawns went out for a stroll and that idea didn’t sit well with us either. Then we remembered a pouch that we had bought many years ago when the boys were puppies. Our solution was to let Sol walk as long as she wanted and then when she tired we would put her in the pouch for the rest of the walk. That way she gets in her walk and still gets to be with the pack and the boys and Luna still get their power walk. It has turned out to be the perfect solution because Sol loves the pouch. She just sits in there with her little paws hanging over the edge taking in all the sites and smells. The good part is that Sol is up to about a half mile walk a day. If the weather is just right she will walk the full mile, but she by no means does this every day. A half mile seems to fit her well and she is very content trotting along behind the three fawns. 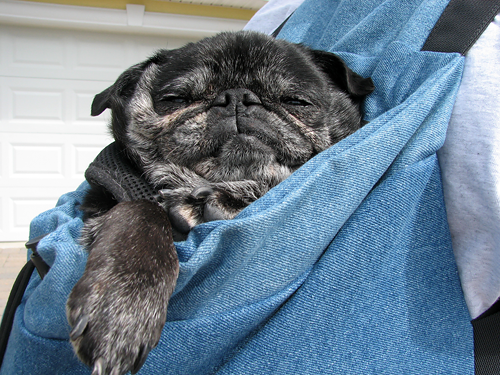 As soon as we see her start to tire we plop her in her pouch and continue on our walk. Relieved to be done with walking, Sol relaxes and smells and snorts the rest of the way home. That HAS to be one of the best happy pug faces ever. What a beautiful face! I think a half a mile at Sol’s age is wonderful. We were at the Arts on the Park in Winter Haven yesterday and met a couple from Canada with 2 pugs. Needles to say, we had to stop and play. We told them about you, your 4 pugs and of course Sol. They may be visitng your web site. How happy and content is she?!?!?!?! Her smile is priceless. Ooooo!! I loooove these pictures.. she is just so precious!! It’s a pugpoose! I love it. Can SOl look any more content? She just shines-like the sun-her pug love beaming in her precious face! I was under the weaterh these past few days and Beauty & Daisey cuddled close to take care of Mom! Now this is seriously cute!! How adorable is she! She knows how much she’s loved, it’s very obvious to the rest of us too! Love it!! What an awwwwww story. Sol may not be able to do the full mile always, but she knows she is loved and will be included in the activity. I love the part of her snorting and smelling her way home in her pouch. What a lovely picture that conjures. As for the question of the day - whether the pugs know how spoiled they are or not, they know how loved they are and that’s what counts. Too, too cute for words. How adorable and how lucky she is to have you! This second picture is now my wallpaper! She is so yummy, I could eat her with a spoon. Course, I’ve never met a pug I didn’t want to nibble on! Since Birdy passed away in August 08, Sleighbelle has gained 4 pounds and now weighs in at a hefty 26 pounds! She is on a special diet and she is getting NO treats! I have to get that weight off of her, both for her sake and mine, I can’t be without my Sleighbelle. She seems to be tolerating the new food well and she is doing ok without the treats, but I know she is thinking that I must be the meanest mom on the planet. It’s my fault she got this way, and it’s my job to get her back to her lean and trim self. Right now I know I could not carry her in a pouch! The vet says it should take 4-6 weeks to get her down to 21 pounds; then I’m going to work to get her to about 18. Which I don’t think she has ever been…she just jumped over and up to 20! This may be my favorite post of all time. What great pictures - Sol is the picture of pug happiness… and it just confirms what we all know to be true - the OPB family is just so in tune with pug needs and wants, and so willing to provide for them… truly inspirational… thanks you so much for sharing these slices of your lives! Sue, you nailed it with your great comments! Looks like Sol’s lip is healed well and you can barely see the little gap there! She is just b-e-a-utiful anyway!! That is so sweet! Sol looks like she is smiling. Indy gets tired out before Gus does alot of times and she does her best to stay right along side him! I had to carry her the other day, she is only 11lbs but wow she got heavy after awhile! I read your blog every day when I get to work, and I know people walking by my desk today must think I’m a crazy lady because of this huge smile on my face. This is the best story and some of the cutest photos I’ve ever seen. And Heather you are so right about the favorite picture thing…it’s waaay too hard to choose just one! I love the pictures of Sol! She is just so happy and content…just like she should be I love it! I love the pictures. Sol is such a lucky girl! Where did you get the pouch? I have been disappointed with some of the pouches I have tried and that one seems like it works great. My Gosh, some of the most precious pug photos I’ve seen. I do the same with my 11 year old chiweenie; walk, then carry. Hi Sleighbelle, Sorry to hear of your recent loss! It’s been 8 years since my dear sweet boston Buttons passed and the anniversary is coming 3/31-I still miss her sooo much! OF course having Daisey & Beauty is such a joy-but just like children-one can never take the place of another-so just wonderful fond memories till we can all be together again when I cross over the rainbow bridge! Oh…my…goodness! What a gorgeous gal is Sol and doesn’t she just look so snug in her pouch?!? Um, the first picture just might be my favorite Pug picture ever. That says a LOT. Sol is my desktop image at work now, that is just toooooo cute for words! That’s what I’m talkn’ about!! Oh, that’s the life for me! I think Miss Sol has charmed her way onto a lot of desktops, including mine! I have the second photo, though. She just has this big contented smile on her face and looks soooo darned cute!